pokemonGO – Launched in 26 countries – Asia still waits for launch. In an official tweet of Niantic Inc. , pokemonGO trainers of Austria, Belgium, Bulgaria, Croatia, Cyprus, Czech Republic, Denmark, Estonia, Finland, Greece, Greenland, Hungary, Iceland, Ireland, Latvia, Lithuania, Luxembourg, Malta, Netherlands, Norway, Poland, Romania, Slovakia, Slovenia, Sweden, and Switzerland are officially allowed to download the app for both Ios & Android. Continue reading pokemonGO – Launched in 26 countries – Asia still waits for launch. Google launched their Nexus 6 finally on October 16, 2014.The much anticipated and hyped mobile device did not surprise rumors and enthusiasts as its fairly what was visualized on rumor renders last couple of weeks. 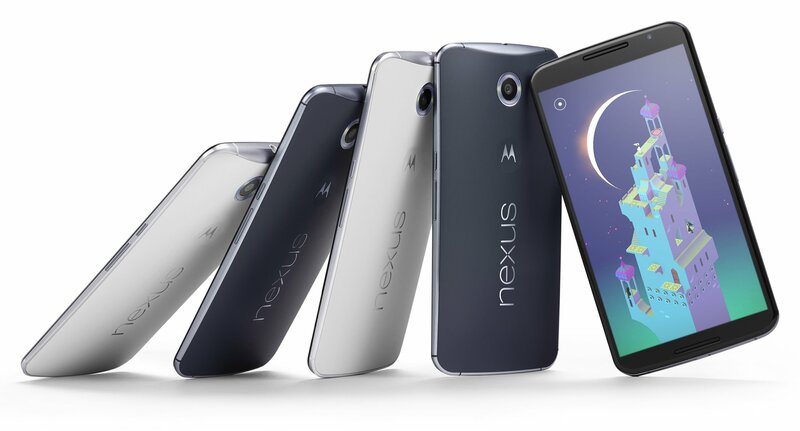 But that said, the new Nexus 6 fairly looks like a chunkier version of the Moto X. Nevertheless it packs flagship hardware specifications and pure Android 5 Lollipop which will prove to set standards for other mobile devices. 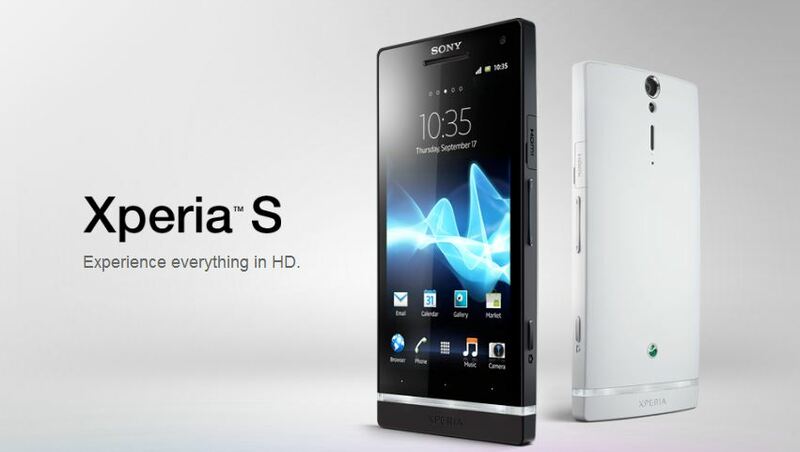 Xperia™ S – EVERYTHING HD! Sony just announced their first Xperia™ smartphone from Sony® at CES2012, and just look at that beauty! Boosting a beautiful Minimalistic Design the Xperia S and surprise surprise, Sony has engineered the first transparent Antenna for the Xperia S according to Rikke Gertsen , Art Director of Sony Xperia Team. The transparent band in the rather bottom part of the device is actually a cut in the Device itself which illuminates in the dark adding amazing ambiance to the already gorgeous design. The 4.3″ Capacitive Touchscreen ;LED-backlit LCD with 16M colors are quite convincing , yet not on level with the amoled displays from Nokia Lumia and Nokia N9. Still its early days for the conclusions as Sony have their Mobile Bravia Engine which makes pictures look more vibrant on the device. The scratch resistant glass on the screen supports up to 10 finger gestures on Sony’s candy-bar, interesting. Running currently on Android 2.3 Gingerbread powered by the Dual Core 1.5Ghz Snapdragon processors and 1GB RAM, the Xperia S will be more than able to get further Android Updates in the future if you are concerned right now ( ICS at second quarter 2012). The browser supports both HTML5 and the “belated” Adobe Flash Based Contents so expecting the mobile browser does good on future benchmarks on Html5 and flash rich content websites, Sony has good you covered in all corners with brower support. When it comes to the Camera, Sony have not compromised in any aspect. A 12 mega pixel camera with Sony’s Exmor R™ for mobile CMOS sensor lets you capture high-quality, bright pictures and videos in poor light conditions, 1080p video recording ;samples are yet to be seen how good they really are against the Nokia N8. They even put a 1.3 Mega Pixel front facing camera with 720p recording for the Skype Calls and Google Talk chats, pretty neat. Thats not all, features like Smile Shutter™,3D sweep panorama,Face Detection,Face Recognition andImage Stabilizer together with Led flash and VideoLight( flash while recording video) should give the edge if you want a great capture companion.Sony also say it to be one of the faster capturing mobile devices out there, time and comparisons would let us know more. Overall the Xperia S looks really good , in design, in hardware and also regards to innovation and experience they have put into this device. There are still lots to be discovered for this device. But it keeps amazing the eyes for now and is currently one of the few shining stars of CES2012. Nokia has done a good job supporting Bengali fonts into mobile phones , compared to other major Mobile brands in Bangladesh’s enormous cell phone market. 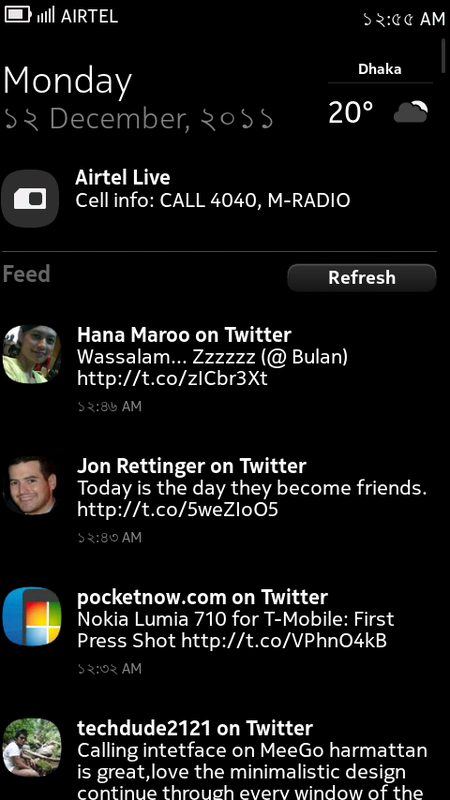 With the N9 , bangla experience is a joy. 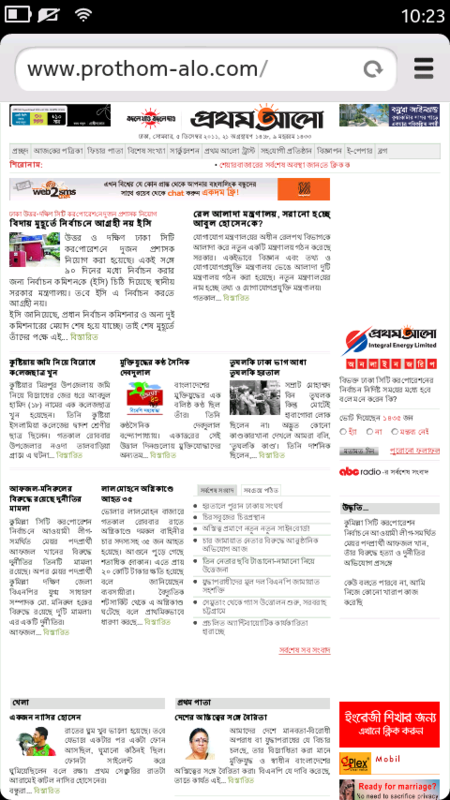 With full bangla character support on web pages, reading sites like prothom-alo and other bangla based fonts are pretty good. Bangla support on RSS feeds and in applications are flawless. 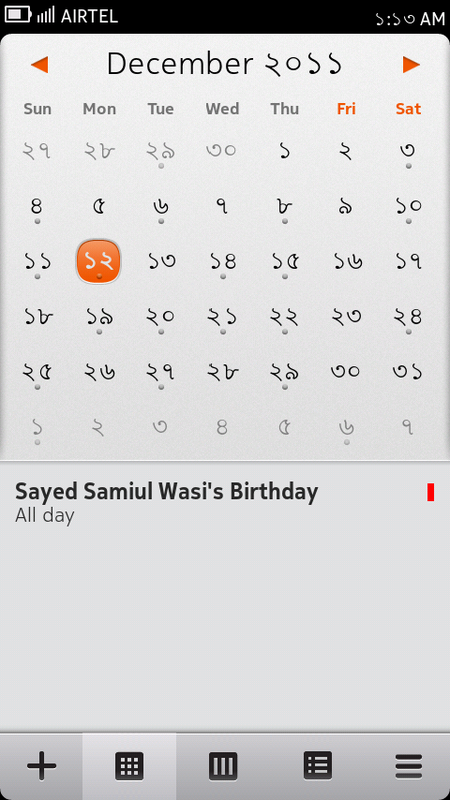 Bengali Numbers are also availble as the Clock on the upper status bar of the N9 interface , even on the lockscreen’s standby clock, which is pretty neat and would make many people exclaim some “wows!” none the less . Calendar looks neat thanks to the sharp numbers. 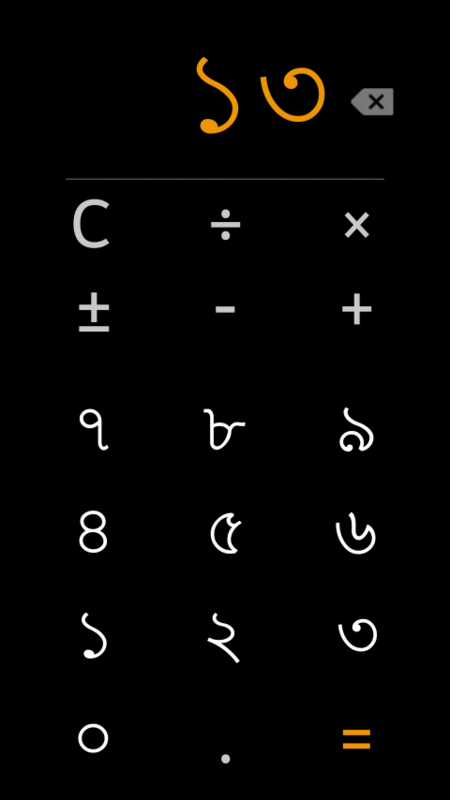 The fun doesnot end here, the calculator application is simply amazing thanks to the bengali fonts. Works perfect with the fonts and a smooth interface makes it the first bengali calculator on a mobile device. 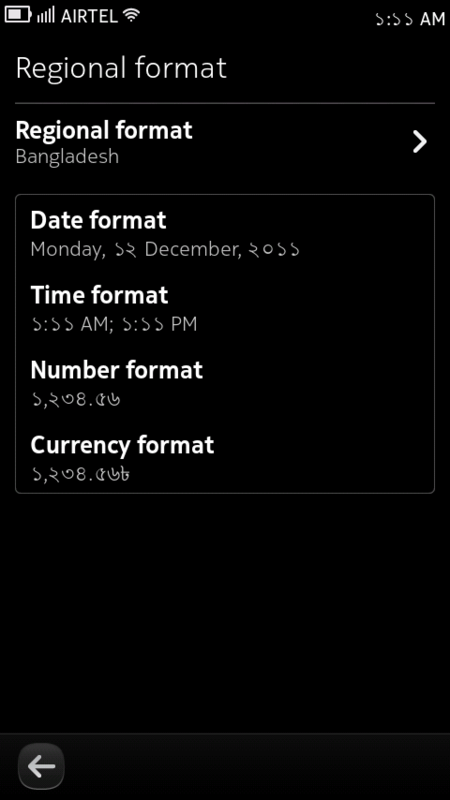 Hats off on that to Nokia , especially Meego OS for supporting the beautiful crisp Bengali Fonts. Meego OS being open source , chances remain open for possible Bangladeshi developers to implement a true bangla user interface on the N9’s brilliant Swipe UI and great Qt based applications for the N9. It would really be welcome if the Meego team at Nokia would come up with improving bangla language support in the main UI for Bangladesh. One of the first things I’m sure you will notice is the beautifully redesigned Home Screen. We made the icons bigger and rearranged them in grid view so you can access the most important functions with a single touch. Even more exciting is that we added three new icons to the list: Recent Chats, N-World and Groupchat . The icon with a half green moon stands for Notifiable and it will appear only next to your Nimbuzz contacts that closed the Nimbuzz app but can still receive push (on the iPhone and Android) or Ping notifications (on the Java and Symbian phones). So when you see this icon remember that we will push your messages to your friend but it might take a while for them to see it since their app is closed. pokemonGO - Launched in 26 countries - Asia still waits for launch.